5 Questions with Dr. Jane Thornton — what is the physical activity prescription? We are having a sit down with Jane Thornton, MD PhD today as part of our recurring blog offering, ‘5 Questions with CJSM.’ Among many other things, Dr. Thornton is the lead author of the new Canadian Academy of Sport and Exercise Medicine (CASEM) Position Statement on the ‘Physical Activity Prescription.’ This article, published in our July 2016 issue, has already drawn an immense amount of interest — it is currently free, so do not hesitate to check it out and print out/download the PDF to fully appreciate its contents. Dr. Thornton is an extraordinarily accomplished individual who is finishing up her family medicine/sport medicine training at the University of Western Ontario. Besides a medical degree, she has earned a Masters and PhD, doing her studies CJSM Associate Editor Connie Lebrun while at the Fowler Kennedy Sports Medicine Clinic. With the Rio Olympics set to begin in a few days, it is perfect timing to conduct this interview with Dr. Thornton. While doing all of that academic work noted previously, she was also training for the Canadian national rowing team. She rowed in the 2008 Olympics in Beijing with the Canadian women’s eight. She knows a thing or two about physical activity, no doubt. In addition to her authorship of the CJSM manuscript, Dr. Thornton has co-created along with Dr. Mike Evans a website about how to #MakeYourDayHarder, advancing the notion that our every day activities offer abundant opportunity to get in meaningful levels of physical activity. At CJSM, we have had an abiding interest in research on various aspects of physical activity (e.g. check out our recent post on #PEPA16 and Ann Gates, another mentor of Dr. Thornton’s), and so it is with great pleasure that we share with you our ‘chat’ with Jane Thornton. 1) CJSM: How effective is an ‘exercise prescription’? What is the evidence for this intervention? JT: It may sound like common sense that physical activity is good for us, but it has taken us a long time to understand just how important it really is as a component of treatment. When we understand that it can lead to improved clinical outcomes in over 30 different chronic diseases, and can be as effective as medication in many instances (hypertension, stroke, and mild-to-moderate depression, to name a few), then we can’t ignore the fact that it should be something we talk about with our patients. To best illustrate its effectiveness, though, let’s compare exercise prescription with smoking cessation counseling. When we examine the number needed to treat (NNT), studies tell us that we need to counsel 50-120 patients to see one patient successfully quit smoking. When it comes to getting one patient to meet the globally agreed upon physical activity guidelines (150 minutes per week of moderate-to-vigorous physical activity), however, that number drops to 12 – meaning we have an incredible opportunity to help patients make a life-changing adjustment in their lives. No one, including me, would argue that smoking cessation counseling is not incredibly important. But given the recent findings that being inactive is almost as bad for you as smoking, we really should be expanding the conversation at each clinical encounter to include exercise. 2) CJSM: What are the barriers to its use? Why aren’t more physicians actively engaged in giving their patients an exercise prescription? JT: The most oft-cited barriers are time constraints, lack of education and training, complex comorbidities… and the most honest among us will also bring up the point that we just don’t think patients are motivated enough or willing to change. Interestingly, if we demonstrate a belief in patients, they will usually rise to the challenge. It may also come as no surprise that doctors who are active themselves are also more likely to counsel their patients to be active. A big obstacle in many countries is, of course, remuneration. It’s hard for some to justify time spent counseling on exercise if there is no billing code they can tack on. That one is a tougher nut to crack. Policy makers should take comfort in the fact that the practice of exercise prescription is also cost-effective. I’ve written recently about the dreams I’m having of the upcoming Australasian College of Sports Physicians (ACSP) 2016 conference–dreams of the warmth and sun of ‘Surfer’s Paradise,’ Australia. Well, these mid-winter dreams have also included other surf spots I’ve been to before, including my home of 10 years in Santa Cruz, California (aka ‘Surf City’). Before coming to Nationwide Children’s Hospital’s Division of Sports Medicine in Columbus, Ohio, I was a Team Physician and doctor of collegiate student health at the University of California, Santa Cruz (UCSC). 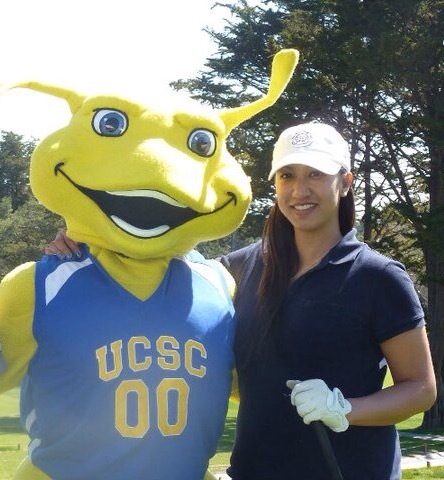 If you have never heard much about the place, I’d wager you have heard about their sporting team’s mascot, rated one of the best in the USA: the fighting banana slugs. Dreams mixing with memory, I turn today to an interview with an esteemed colleague with whom I once worked while at UCSC: Primrose Pisares, the head, certified athletic trainer (ATC) for those fighting banana slugs. She shares her thoughts on her profession, on her athletes, and on her beautiful community in our ‘5 Questions’ series. 1) CJSM: How long have you been the head ATC for UCSC? What was your training and/or ATC working history prior to coming to UCSC? PR: My path to becoming an athletic trainer was not direct, as it is for many of today’s ATCs. I started as an undergraduate majoring in Physiology at UC Santa Barbara and had intended to be a physical therapist. Athletic training was something that I had discovered as I progressed in my pre-physical therapy studies. From the extracurricular athletic training classes I took, I found that I liked working with active patients more than working with the general population. I’ve always wanted to go into a profession that helps people, and the challenge of rehabilitating an athlete from an injury and getting them back to full athletic performance was intriguing and satisfying. After I completed all the requirements and sat for the certifying exam, I attended the Arizona School of Health Sciences at A.T. Still University, which is where I received my Master’s degree in Sports Health Care. Primrose hard at work with one of her athletes. 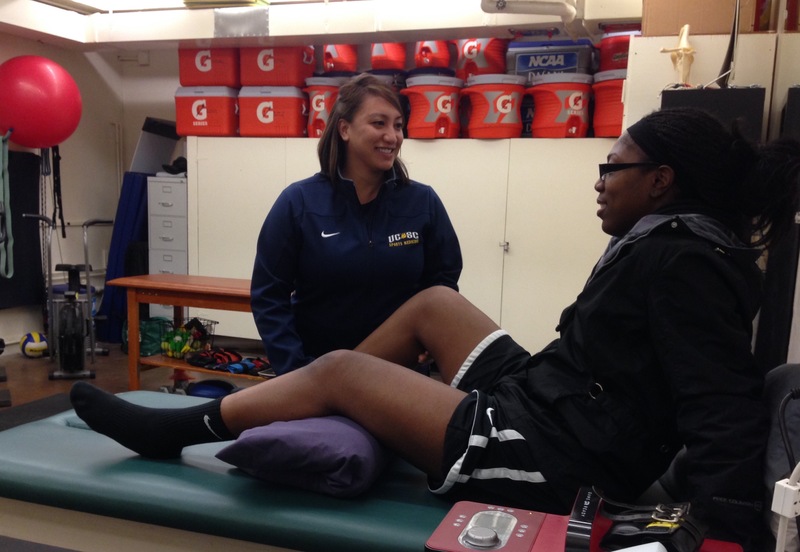 I am going into my tenth year as the head ATC for Intercollegiate Athletics at UCSC. Now that I am saying it out loud, I am kind of amazed at being in one place for that long! I have had prior experience working in high schools, physician’s clinics, and with semi-pro athletic teams. Right before I started at UCSC, I was employed at a few community colleges in the area and my intention was always to work in the community college setting. The opportunity to work at UC Santa Cruz just kind of fell in my lap as I had never considered DIII athletics. I have come to really enjoy working with student-athletes at this level and getting to know them as more than just an athlete but as a person with academic goals and interests. I love it when my student-athletes achieve what they have worked hard for. 2) CJSM: As you’ve pointed out, UCSC is a DIII Athletic School, the only one of its type in the UC system. Based on your experience with UCSC athletics, what are the special opportunities or challenges for managing athletes’ health care in DIII NCAA sports? As I get ready to head out to South Africa as one of the ‘Travelling Fellows” of the American Medical Society for Sports Medicine (AMSSM), I can’t help but think what previous Fellows may have experienced on their own journey. I decided to reach out to one of the 2014 Fellows, Dr. Irfan Asif, who happens also to be a rather productive CJSM author. Dr. Asif is Associate Professor in the Department of Family Medicine, in the Greenville Health System at the University of South Carolina Greenville School of Medicine, and is Vice Chair, Academics and Research Director of the Sports Medicine Fellowship there. He is also co-chair for the fellowship committee within AMSSM. In a tangential way, Dr. Asif came to mind this morning as I was driving to work, catching up on the overnight sports news while listening to ESPN’s Mike & Mike. Mike Golic, in commenting on Derrick Rose’s most recent injury, stated that a key ingredient to success in life boils down to this: often times, the secret to ability is one’s availability. I couldn’t agree more, and I couldn’t pick a better examplar of this notion than Dr. Asif. With all the many, many hats he wears, with all the duties he has, he responded within minutes to my initial query about being a guest on “Five Questions with CJSM.” And within one day we got down to business and conducted this interview. Talk about availability. Talk about ability….and now, let’s talk about the AMSSM Travelling Fellowship and more, with Dr. Irfan Asif. 1) CJSM: In 2014 you were one of the inaugural travelling fellows for the AMSSM. Who joined you on your journey to Australia? What do you remember as some of the high points of that journey? IA: It was an honor to be selected as one of the AMSSM inaugural traveling fellows to Australia. I was accompanied by my colleague Chad Asplund, as well as, one of the founders of AMSSM and current president/CEO of the ABFM, Jim Puffer. The trip was fantastic. We had the opportunity to meet legends in the field of sports medicine including: Peter Brukner, Peter Fricker, and John Orchard. Each uniquely contributed to our trip. For example, Dr. Brukner demonstrated the power of dry needling, Dr. Fricker provided valuable insight into the medical care offered at the Australian Institute of Sport, and Dr. Orchard demonstrated the significance of developing league-wide (Australian Rules Football) research that can ultimately manifest as rule changes in sport to provide a safer environment for competition. In addition, we had the privilege of meeting Andre La Gerche and Chris Semsarian who are some of the premier thought leaders in sports cardiology. Aside from these experiences, we participated in educational grand rounds and conferences on topics such as: Sports Cardiology, Sports Concussion,Heat Illness, Regenerative Medicine, and Exercise as Medicine. The most meaningful memories, however, were getting to know Chad and Jim on a deeper level, including Chad’s personal stories of providing medical care during tours in Afghanistan, and Jim’s journey to becoming a leader in family and sports medicine. Special thanks to DJO Global for sponsoring our trip. 2) CJSM: What is your work like on a day-to-day basis? Can you tell us a little bit about your clinic responsibilities; your teaching and research; what sports teams you may have to cover? IA: Work is exciting, with heavy doses of family and sports medicine. My major roles within the Greenville Health System/University of South Carolina Greenville School of Medicine include being the Vice-Chair of Academics and Research for the Department of Family Medicine, and the Primary Care Sports Medicine Fellowship Director. As Vice-Chair I oversee the training curriculum and environment for medical students rotating in family medicine, two family medicine residencies, and our fellowship programs. In addition, I am developing the research infrastructure for our research division, which is focused on patient-centered outcomes research, comparative effectiveness trials, and quality improvement initiatives. We partner with local programs such as USC Greenville School of Medicine, Furman University, and Clemson University to improve the healthcare of our region. As the director of our sports medicine fellowship, I have the opportunity to lead one of the largest PCSM Fellowship Programs in the country (12 CAQ PCSM physicians with an athletic training network covering 50 locations and >20,000 athletes). Aside from high school sports, we assist in the care of athletes from USA Karate, USOC Para-athletes, professional baseball, and Division I & II Collegiate programs. Currently, my clinical focus is centered on using lifestyle modification measures (exercise as medicine, healthy nutrition, behavioral modification, etc.) to prevent, manage, and treat non-communicable diseases such as cardiovascular disease, diabetes, and hyperlipidemia. We still see routine musculoskeletal injuries, but I believe that primary care sports medicine can also play a larger role in the health of the every day individual…everyone is an athlete; sometimes, they just don’t know it yet. Last, my primary research focus has been on the prevention of sudden cardiac death in young athletes. Our research team has examined several different domains within this field, including: epidemiology, screening, resuscitation strategies, and the psychological impact of being diagnosed with cardiovascular disease. This year, we developed the “Connected by Hearts” program as a support mechanism for athletes who are diagnosed with potentially lethal cardiac disorders. 3) CJSM: You were chair of the 2015 AMSSM Annual Meeting’s planning committee, and we thought you did a fabulous job with that. What role do you have with the 2016 meeting, in Dallas? What are you looking forward to in Texas? IA: Thank you for the kind words regarding the 2015 AMSSM Annual Meeting. If I could be humble, this was professionally the most fulfilling task that I have completed in my career. None of it would be possible without the leadership of Jon Divine and the entire program planning committee…They were simply outstanding. The 2016 Annual Meeting commemorates the 25th Anniversary of the AMSSM organization. Marci Goolsby has put together a phenomenal program using a “Back to the Future” theme that celebrates the work of our founding members. As part of the program planning committee, I have focused my efforts on Faculty Development, which you will see at least 6 times within the program. Most physicians equate faculty development solely with academic medicine; however, faculty development encompasses any environment of education, regardless of where it may be. We kick off the meeting with a special lecture by an invited speaker, Dr. Michael Wiederman, who will explain this paradigm during a session titled, “What is Faculty Development?” We then offer 4 free Faculty Development ICL sessions that cover how to provide feedback, masterful mentoring, journal club, and journal publication (Editors from CJSM, BJSM, and Sports Health will participate). Finally, we will offer a special session on how to implement and teach an ultrasound curriculum. 4) CJSM: If you had to compose a 140 character tweet to describe how the AMSSM travelling fellowship has impacted your life, your career, what would it say? 5) CJSM: You were lead author of a 2013 CJSM study on the leading cause of death in NCAA D1 athletes that got a lot of press. Were suprised by the results? Prior to that study’s initiation, had you any idea of the impact of MVAs on our NCAA student athletes? IA: This study was, no doubt, a surprise. While is it common knowledge that MVA’s are the leading killer in the general population for this age group, I wasn’t sure if this was the case for athletes or not. Often, we hear only about morbidity and mortality that occurs on the playing field. While sudden cardiac death, heat illness, and concussion are important health concerns in the athletic population, we must consider the impact of medical care for the athlete both inside and outside of competition. Simple questions that assess potentially risky behavior (e.g. Do you wear a seat belt, do you drink and drive, do you text while driving, etc.) can go a long way in ensuring the health and safety of the athletes we manage. We hope that this article, and some of our new work on mental health in the athlete, can go a long way in re-defining our role as sports medicine physicians. Thanks a lot Irfan, for your time and your insight. Exciting to hear about AMSSM’s celebrating its 25th anniversary: we are doing the same here at CJSM! We may just have to figure out a joint way to celebrate our organizational silver anniversaries in Dallas! As an American who has yet to visit Australia (for shame! ), I have only a dim appreciation of the sport. I have previously written about Footy in a blog post and I read eagerly the occasional article on the sport that make it into the U.S. press; the New York Times, for instance, had a recent article on the search for American talent that may cross-over to Australian rules football. Who knew that basketball players may make great ruckmen? Well, plenty of Australians apparently!!!! The Twitter chatter about the study has been substantial, and it has hit the mainstream press as well. Our Editor-in-Chief Chris Hughes has made it one of the ‘Editor’s Picks’ this month–it is freely available for a short time. And now we have the pleasure of having the lead author, Dr. Alexander Donaldson, join us for “5 Questions with CJSM” to talk about Footy and FootyFirst, the exercise intervention which is the subject of the study. 1) CJSM: Asking as an ignorant American: What are some of the significant differences between Australian football and American gridiron football? Or for that matter, between Australian football and rugby, a sport with which I do have some familiarity? AD: Where do I start to answer this question? Firstly, unlike American gridiron football or rugby, Australian football does actually involve a lot of kicking a ball to gain ground rather than throwing or running with the ball. In fact, to score a goal in Australian football the ball has to be kicked between the goal post, not caught in or carried into an end zone. Another key difference is that unlike any other form of football, Australian football does not have ‘line of play’ or any sort of off-side rule. It is more like basketball or ice hockey in that players can position themselves anywhere on the field at any time and can enter a contest for the ball from any angle or direction. Like American football and rugby, Australian football is a full contact collision sport However, the only protective equipment commonly worn by Australian football players is a mouth guard to prevent dental injuries – no shoulder pads, and only the occasional soft-shell helmet and body padding, usually only worn to protect an existing injury. At the elite level there are some similarities between the way the American football and Australian football are administered with both having a salary cap and a draft system to embed a certain degree of equalization of the competition over time. 2) CJSM: What is “FootyFirst”? At the risk of conflating two dissimilar interventions: how may it resemble (or differ from) the FIFA 11+ warmups that have been used in football (soccer)? As an injury prevention intervention—how much time is required to perform FootyFirst for the teams adopting the program?